Laurie & Adam were anticipating this Christmas. They were anticipating the birth of their 2nd child. Christmas came and went, as did New Years, but there is something about the moon that brings babies into the world. On the night that baby Daphne was born, the moon was as full as could be. She was well worth the wait. We all expected Laurie's labor to be quick, so as soon as labor began, I rushed to meet them at the hospital. Things had progressed quickly and baby would be earth side very soon after I arrived. A beautiful moment of serenity in the chaos. A deep breath. This is a moment of gathering strength. Welcome to the world Daphne. Laurie's labor was quick. Many women wish for a quick labor, but honestly it has a downside. Quick labors sometimes bring a sense of being out of control... not being able to get grounded. In spite of this, Laurie handled this birth with beauty and grace. She rocked it. Who cut the cord? The woman who brought this baby into being. She fostered life and then was able to control the moment when that tender connection was removed. Daddy's also need connection and skin-to-skin is a great way to begin the bonding process. My relationship with this couple is a gift. 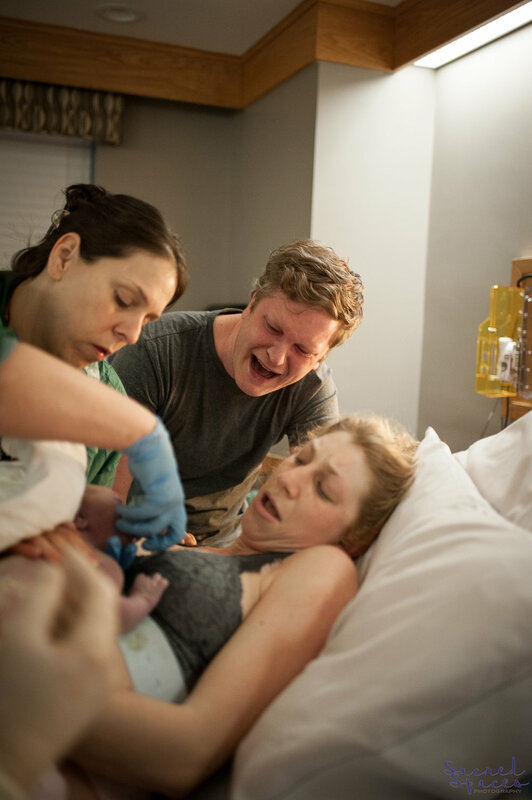 As their doula and birth photographer, I was able to walk through the process of labor and recovery with them, as well as give them the chance to have a few of the memories from labor captured. I am honored to do this work and constantly feel humbled by each woman's birth experience.